Psarou beach it’s not accidental meeting point of celebrities and businessmen from all over the world, as the beach is the ultimate place to see and to be seen! It is considered as the most cosmopolitan beach in Mediterranean Sea. Psarou is a beautiful organized sandy beach in Mykonos with clear waters, attracting thousands of visitors during summer. The beach is formed by several small creeks; with its white sand and the light blue clear water, with its special atmosphere, it conveys a mood of rest and relaxation, while it’s well protected from the northern winds by the surrounding hills. It is separated from the beaches of Ornos and Korfos by a rather long low mountain named Diakoftis. It was not until the ‘80s that Psarou became the most cosmopolitan beach of the island, with its high class atmosphere. Since then it’s been a favorite meeting point for celebrities and VIPs from around the globe, who come to enjoy absolute relaxation and excellent service, at their best. 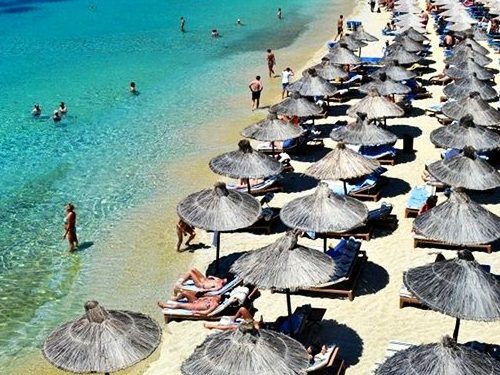 In Mykonos, Psarou beach is the most famous place where you can see all the famous artists, actress, business man and general all the rich people from all around the world. In Nammos, the full organized beach service there, you can do whatever you want. There are so many reservations all day long to book an umbrella due to its popularity. During the high season there is a waiting list. Champagnes and dozens of fireworks light up the sky at the Nammos dinner party. Psarou provides you water sports, lifeguard and easy access.